The Hotchkiss Memorial Library was erected in 1892-93 thanks to the generous gift of Maria Bissell Hotchkiss in memory of her husband Benjamin Berkeley Hotchkiss of Sharon, Connecticut.The Building's style is Romanesque Revival. Its outer walls are limestone quarried in Sharon. The interior walls and floors are solid oak with 10 panels of stained glass windows depicting world renowned authors. 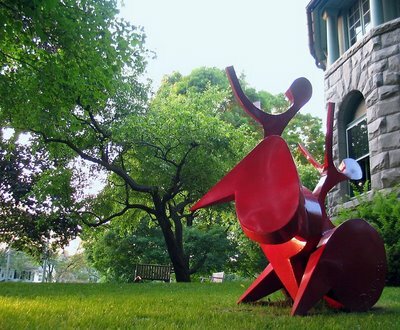 The sculpture out front is by a local Kent, CT artist, Denis Curtiss. For the next few days I'll offer a tour of the Town Green and some of the notable buildings and houses on Upper Main Street and West Main Street. what a great abstract artwork and an even better last name - at first glace it looked like hotkiss!